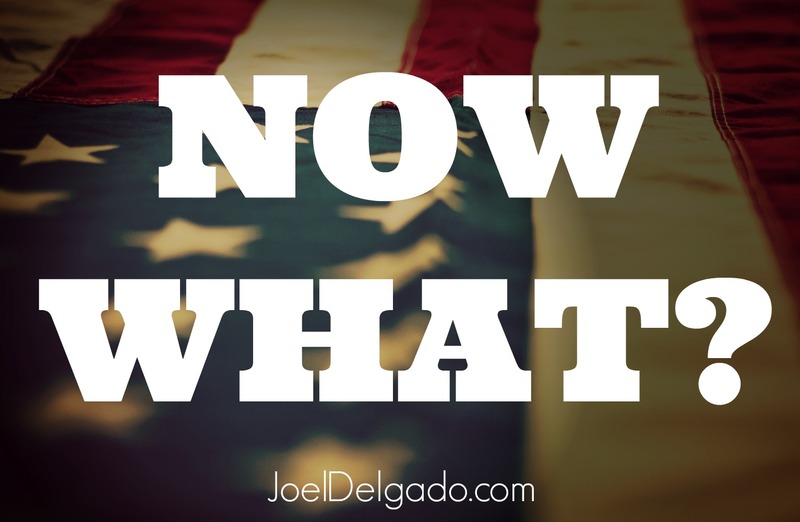 JOEL DELGADO: The Election Is Over. Now What? We’ve watched almost two years of wall-to-wall campaign coverage, argued politics in Facebook comments sections for hours on end and endured an onslaught of political advertisements and random strangers asking us if we’re registered to vote. And now we have chosen a new president. Chances are, you’re not happy. You’re not happy with the candidate that won. You’re not happy with Uncle Bob or your friend Jane. You’re not happy with leaders you used to admire. You’re not happy with the media. You’re not happy with America. Maybe “you’re not happy” is an understatement. You’re probably sick and tired of all of it. Let’s go a little further, you’re probably mad as hell. I’ve felt it, too. The anger. Disgust. Frustration. Sadness. Disappointment. Those emotions have led me to think, say and do some things I’m not proud of. I have strong opinions, I’m passionate about those opinions and I get emotional about them – not always a great combination. Don’t get me wrong – I have had some great conversations with wonderful people, many of whom disagree with me on just about everything. Those exchanges have helped me understand why people are thinking the way they are and have helped me shape my own stances on certain issues. I hope you’ve had some of those types of interactions, too. But I’ve also let my emotions run wild, both in person and on social media. Now it’s over. The votes have been cast, the winners announced, and the speeches delivered. But it’s not really over is it? The wounds and divisions that have been caused by this election might take a long time to heal, if they ever heal at all. The anger is still very real and very much on the surface for all to see (just take a quick glance at Facebook or Twitter). We’ve pitted ourselves against each other based on a wide variety of lines: race, gender, religion, socioeconomic status, political party… the list goes on and on. The most disheartening thing for me has been the division among Christians in this election and how we’ve let two political candidates rip people of faith apart from the inside out. We need to heal. We need to heal as a Church and as a country. But how? I don’t have a lot of answers, but just some thoughts on how we might get started. Frank Luntz probably had the worst job in America over the last year. Luntz is a public opinion analyst and he has been talking to hundreds of Americans in focus groups throughout the country over the past two years. He’s lamented throughout the year about the breakdown of civility in America, having seen it with his own eyes. The seeds of this anger and resentment were planted long ago, but they’ve sprouted rapidly and in an ugly way in the soils of this election cycle. A focus group conducted by Luntz for 60 Minutes just days before the election perfectly illustrated that. It’s worth the watch to get a better understanding of the political climate in America. We all need to take responsibility for our role in the deterioration of civil discourse. We have access to this megaphone called social media that allows us to express our opinions and disgust, but we don’t take time to listen to what other people are saying. People are hurting. People are scared. People are concerned with issues that maybe we haven’t thought about. Why can’t we just listen and validate that? Why can’t we allow someone to share their experience without telling them they are wrong? Why can’t we just listen? The Bible states that everyone “should be quick to listen, slow to speak and slow to become angry, because human anger does not produce the righteousness that God desires” (James 1:19-20). I hope we can put that into practice from this point forward. Chances are in the heat of arguments, we’ve said something to someone we probably regret. We’ve made assumptions about them or called them nasty things or labeled them a certain way. We need to show some humility, apologize and ask for forgiveness. We need so say “I’m sorry” to our family members, friends, coworkers and neighbors. But I’m right! Doesn’t matter. Sometimes it’s not just what you say, but about how you say it. You’re not going to change hearts and minds in a shouting match, an angry tweet or a Facebook rant. Swallow your pride. Ask for forgiveness. It’s the first step to mending the fences of our relationships, our communities and our nation. And speaking of forgiveness, we need to forgive people as well. There have been a lot of hurtful things said, both in person and online, and chances are you’ve been hurt by the words and actions of some “friend” or complete stranger on Facebook. The Apostle Paul urges us in Colossians to “bear with each other and forgive one another if any of you has a grievance against someone. Forgive as the Lord forgave you” (3:13). It’s not worth holding on to a grudge and carrying that anger around. The person unforgiveness affects the most is you. And eventually those feelings of resentment and anger and frustration will boil to the surface and you will cause damage to your friendships and relationships. You will hurt your witness. And after a while, you’ll probably find yourself isolated in your bitterness. There is no peace or unity where there is no forgiveness. Please, let it go. Forgive as you’ve been forgiven. And move on. I deleted the Facebook app on my phone for Election Day and the morning after. I can’t take the “sky is falling” rhetoric, the name-calling and the gloating. Paul writes again that “as Godʼs chosen people, holy and dearly loved, clothe yourselves with compassion, kindness, humility, gentleness and patience… and over all these virtues put on love, which binds them all together in perfect unity” (Colossians 3:12, 14). If your candidate won, remember that there are people who are grieving the loss of the other. Show them the same compassion and gentleness you would have hoped to receive from them if it was the other way around. Don’t gloat. Don’t rub it in people’s faces. Show some integrity. If your candidate lost, remember that the sun is still going to rise in the morning. You’re probably feeling a combination of anger and sadness that makes it tempting to lash out at the world. Proceed cautiously. I have friends who voted for Trump. I have friends who voted for Clinton. I have friends, like me, who voted for neither. They are all still my friends. I still love them. I don’t want to say or do anything that would contradict that and hurt the people I say I care about. I was not going to be happy with the result from yesterday’s presidential election either way, for many reasons. But more than ever, and this is true after every election, I always need to remind myself that – no matter who is in the White House – Jesus is still my Lord, my Savior and my King. God is still in control and He wasn’t surprised by the results of this election. Psalm 46 was an encouraging read for me this morning: “He says, ‘Be still, and know that I am God; I will be exalted among the nations, I will be exalted in the earth’” (v. 10). When we put our hope in anything outside of Jesus – whether it’s a politician, a job, a relationship or whatever – we will inevitably end up disappointed. Jesus is the only thing worth putting our hope in. He is always true. He is always good. He is always faithful. And we have everything we will ever need in Him. Don’t lose sight of that in an election where everyone from our mother to the media is telling us the fate of the world depends on who wins. Brant Hansen nailed it in a tweet the other day: “If God wanted to, He could have sent us a Great Politician. But He didn't. He gave us a Healer, and a Savior, because that's what we need." I’ll end with this: the most powerful thing we can do to change the trajectory of our nation, our communities and our own hearts is to pray. There is no substitute. First, we need to pray. Pray for our leaders at all levels of government, regardless of what political party they’re from, for our country, our friends, our neighbors and ourselves. And then we need to go. We need to love our neighbors like never before. We need to listen to others like never before. We need to become more thoughtfully engaged in the civic process than we ever have. There’s an old saying that goes “pray like it depends on God and work like it depends on you.” Now is the time to put that into practice. Despite all that’s happened, I still have hope for America. I still believe we can one day become the shining city on a hill we were meant to be. A people marked by love, liberty, compassion, integrity and virtue who put their trust not in man, but in the Creator who endowed us with certain unalienable rights. I hope we will not let ourselves as a people be defined by who is president, who is on the Supreme Court or who is in Congress. Our worth and value, and that of our fellow countrymen, always came from Him. Love God. Love people. Let that be our guide moving forward. These questions are important in order to find out yourself from your busy routine.We often don't think much about our priorities and our happiness and dedicate our lives to other but that's wrong.